3D printing filament is the thermoplastic feedstock for fused deposition modeling 3D printers. PLA (Polylactic Acid) is one of the two most commonly used desktop 3D printing filament.It has the virtue of being both odorless and low-warp, and does not require a heated bed. ABS (Acrylonitrile Butadiene Styrene) is another commonly used 3D printing material. Best used for making durable parts that needs to withstand higher temperatures. The 3D printing filament market is expected to grow from USD 1.3 billion in 2018 to USD 4.4 billion by 2023, at a CAGR of 27.1% from 2018 to 2023. 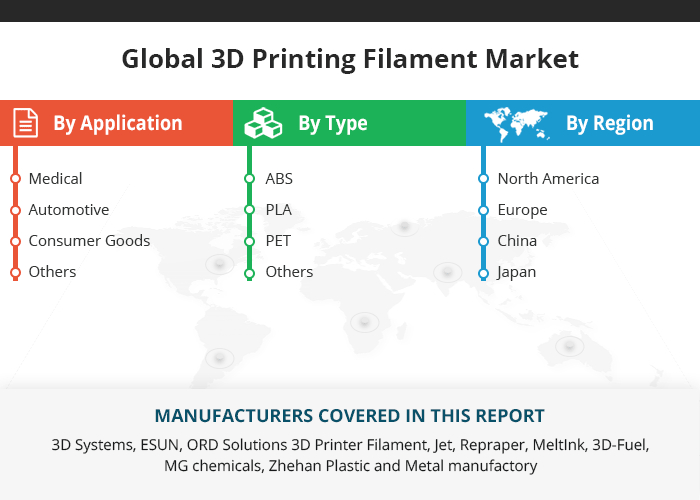 This report focuses on 3D Printing Filament volume and value at global level, regional level and company level. From a global perspective, this report represents overall 3D Printing Filament market size by analyzing historical data and future prospect. Regionally, this report focuses on several key regions: North America, Europe, China and Japan.